Hashimoto’s disease is the term commonly used for Hashimoto’s thyroiditis, a common autoimmune condition that leads to hypothyroidism. Can it be cured? What is hashimoto's disease? Our post spells out the cause of the condition, which is alto known as Hashimoto's thyroidism. The onset of Hashimoto’s disease is often slow and subtle. It typically begins with enlargement of the thyroid gland in the front of the neck, known as goiter. Sometimes this leads to a noticeable swelling, fullness in the throat, or a (painless) difficulty in swallowing. Gender. Hashimoto’s disease affects eight times as many women than men. Age. Hashimoto’s can affect people in adulthood at any age; most women present between the ages of 30 and 50. In men it usually occurs about 15 years later. Genetics. Family history of Hashimoto’s increases the risk. People with another autoimmune disease, such as Addison’s disease, autoimmune hepatitis, celiac disease, lupus, pernicious anemia, rheumatoid arthritis, Sjögren’s syndrome, type 1 diabetes, and vitiligo (a condition where some parts of the skin become de-pigmented). Pregnancy. Among women who develop thyroid disease during pregnancy, 20 percent go on to develop Hashimoto’s disease in later years. 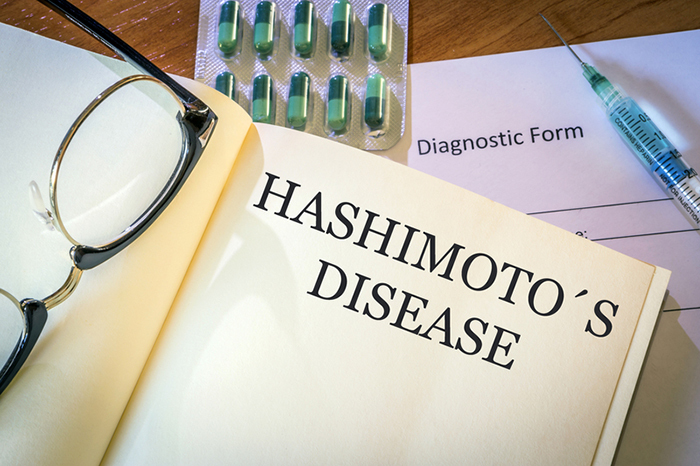 Excess iodine and some drugs are sometimes implicated in triggering Hashimoto’s disease in at-risk individuals. Radiation exposure increases the risk of autoimmune thyroid disease. Worldwide, the most common cause of hypothyroidism is iodine deficiency, rather than Hashimoto’s thyroiditis. Blood test. Thyroid tests may include TSH (thyroid-stimulating hormone), thyroid hormone (T4), free T4, T3, and thyroid antibodies (positive in about 85 of people with Hashimoto’s). Your doctor may also request a complete blood count for anemia (which is seen in 30 to 40 percent of patients), lipid profile, or metabolic panel (including sodium, creatine kinase, and prolactin levels). Imaging. Thyroid ultrasound may be requested. Thyroid biopsy. Your doctor may recommend a biopsy of any suspicious lumps in your thyroid to rule out cancer or lymphoma. Medical treatment: Thyroid replacement therapy. Hashimoto’s disease usually responds well to treatment with levothyroxine, a man-made form of T4. Most people need lifelong treatment and regular monitoring of T4 and TSH levels. Fine-tuning of dosage is needed to keep levels within the normal range.Patients can easily slip into hyperthyroidism, which is harmful especially to heart and bone health. Symptoms of hyperthyroidism may include a fast or irregular heart rate, nervousness/excitability, fatigue, headache, sleep disruption, shaky hands, and chest pain. Surgical treatment. Surgery is rarely needed but may indicate whether there is a large goiter that causes obstruction or cancer. Surgery also may address cosmetic concerns if the goiter is unsightly. Self-care. Since Hashimoto’s disease is an inflammatory and autoimmune condition, lifestyle changes may be a useful adjunct to medical care. There are numerous reports of individuals curing themselves with lifestyle adjustments, but formal research, specific to Hashimoto’s, is lacking.Switching to a plant-based diet low in processed foods and rich in fresh fruits, vegetables, whole grains, healthy proteins and fats (avocados, fish, eggs, nuts, and seeds) is a great place to start. (See our article “Anti-Inflammatory Foods: Do They Work?“) An integrative medicine physician, nutritionist, or naturopath can help you explore which foods may be causing your inflammation. 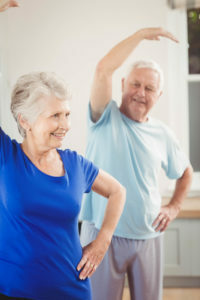 Other lifestyle changes proven to reduce inflammation include regular exercise, restful sleep, and stress management techniques (e.g., meditation). If you have Hashimoto’s disease and are pregnant, or are thinking about trying for a baby, talk to your endocrinologist and OB/GYN. Levothyroxine is safe in pregnancy and when breastfeeding, but levels will need to be tested more often. addison s disease, anemia, anti inflammatory, anti inflammatory foods, arthritis, autoimmune thyroid disease, blood pressure, bone, bone health, breastfeeding, cancer, cancer surgery, celiac, celiac disease, chest pain, cholesterol, constipation, creatine, depression, diabetes, diet, digestive, exercise, health, heart failure, hepatitis, high blood pressure, high cholesterol, hormone, hyperthyroidism, hypothyroidism, immune system, infertility, inflammation, integrative, iodine, iodine deficiency, irregular menstrual periods, joint and muscle pain, lipid profile, lupus, lymphoma, lymphoma treatment, meditation, memory, memory problems, miscarriage, muscle, muscle pain, nervousness, nuts, pain, plant based diet, processed foods, radiation, reduce inflammation, restful sleep, rheumatoid, rheumatoid arthritis, skin, sleep, stress, stress management, stress management techniques, thinning hair, thyroid, thyroid biopsy, thyroid doctor, thyroid hormone, tiredness, type 1 diabetes, underactive thyroid, underactive thyroid symptoms, uterine, uterine wall, vegetables, weight gain, what is hashimoto s disease, whole grains. I thought you might be interested in this article on https://universityhealthnews.com: What Is Hashimoto’s Disease?